I went back and forth about writing this post. It is a little graphic, and it is a little personal for one of the kids. But in the end, I felt the need to document this struggle while it was still fresh in my head, not diminished or deemed "not that big of a deal" months later. Because it was a HUGE deal. I'm also hoping that if there are any other parents out there with a child going through the same struggle, they can be encouraged - maybe even pick up a tip or two. No need for us all to go through this alone! For the last 11 months, Samantha has had a problem. A poop problem. 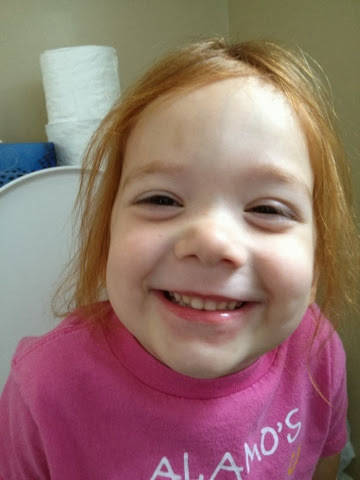 I started potty training her early December 2012, and from day 1, she decided that going #2 on the potty was waaaaay too scary and hurt too much, and ever since then, she has done everything in her power to just not go. Ever. Little girl could and would go days and days without, well, going. It was a vicious cycle. The more she held it in, the more it hurt when it finally came out (and as we all know, despite her best intentions, it ALWAYS comes out), thus perpetuating the cycle. When push came to shove (literally) and it had just been too long, we had to find ways to MAKE her go. Every time. For the last ELEVEN MONTHS. 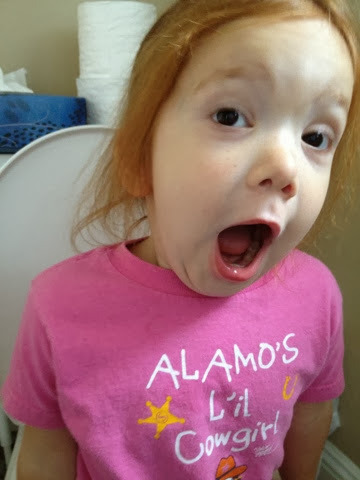 It was physically uncomfortable for her, and emotionally draining for her parents...having daily activities dictated or derailed by a 3yr-old's bowel movements, or lack thereof. "I'm sorry, we're not going to be able to make it. Sam won't poop." I know this is a season of life and there are much more difficult or scary things parents deal with every day. Like seizures. Or MRSA. Or seriously horrible things. But knowing this is not the worst thing ever does not diminish the fact that it is still hard. The fact that it was all psychological on her part made it that much harder. I know she was scared, but this was her CHOICE. Or, as it started to feel as the months dragged on and on and I became more and more drained, it started irrationally feeling like, "She is choosing to do this TO US." We tried everything we could think of. Coaxing. Bribing. Logical discussions. Threats. Ignoring it and pretending we didn't notice her [very obvious] discomfort. Prune juice. Miralax. Fiber gummies. Avoiding bananas. Loading her up with bananas. Eating nothing but oatmeal. We tried every angle. Nothing worked. NOTHING. 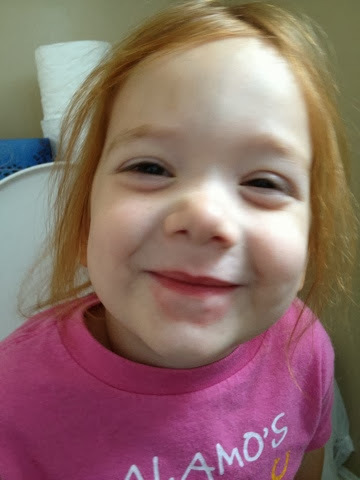 Make her sit on the potty until she went. This was not as easy as it sounds. At the beginning, her gross motor delay came in handy because she physically couldn't get down, so she was pretty much stuck there, rocking back and forth, screaming. It was very sad. But as she got older, she would just decide she had had enough, get down, and leave the bathroom. We finally had to stand guard, holding her there, trying to minimize her extreme "I'm going to keep this from coming out!" rocking back and forth, which got poop everywhere, and was not the cleanest/most sanitary situation for her. This would take anywhere from 10 minutes to over an hour. Each time. Did I mention the screaming? Not let her sit down / not let her hold herself. If she could not physically keep it in (which is how she went so long between going), there was no other choice - it had to come out. She would fore-go any activity if it meant she could stay seated and hold it in. She skipped swimming at the hotel pool. She skipped soccer. She skipped all sorts of things we know she really wanted to do because she was just that scared and/or stubborn. (After months and months of this, it was hard to tell the difference.) Not letting her sit usually involved putting a diaper on her and holding her in a bear hug just under the armpits, so her arms were up too high for her to hold herself. After only a minute or two of screaming, one of the screams would eventually turn into a very loud push, and I could breathe a sigh of relief - the end was coming, and we could take a break for the next couple of days until we did it all over again. Threaten her with an enema. Put it in plain site and tell her that one way or another it was time for everything to come out - the choice was hers how that happened. We only used these two or three times total in all those months, but very rarely did she CHOOSE pooping on her own over the enema. Like I said, nothing really worked. It got so bad that she just started leaking all the time (I know...TMI), meaning she NEVER really pooped anymore...she just lived in a state of perpetual uncomfortableness sometimes alleviated by a state of a little less uncomfortableness. When I got tired of all the underwear scrubbing from the leaking, we put her back in diapers during the day to contain the constant mess. But Sam is super smart, and figured, hey, since I'm in a diaper anyways, I might as well stop using the potty altogether. Nooooo not going backwards! So, after that, I regularly put sanitary napkins on her. Yeah, it was fun explaining that one to her preschool teacher. Most people with whom we interacted regularly knew the situation. Everyone felt bad for Sam. Everyone hoped she would make the decision to stop this madness ASAP. No one more than us. Our friend Kristin came over one day last month to pick up some videos, and noticed Sam curled up on the floor, uncomfortable, whimpering. A common occurrence, varying in intensity based on how long it had been since she had gone last. Kristin immediately took pity on poor Sam. She knew it was a psychological battle this tiny person was fighting, and she promised to pray for Sam regularly. Then one day, two weeks ago today, after a horrible evening ending in a bear-hug, Sam woke up and decided, "I'm going to poop today." You always hear that's how it happens. That it's as simple as that. But when it's been SO HARD for SO LONG, you don't really believe it. It can't just STOP for no reason! That weekend, Kristin approached me in church with a very concerned look on her face. At first, I wondered what was wrong, and was amazed when she quietly asked me, "How is sweet Samantha? I have been praying for her every day." 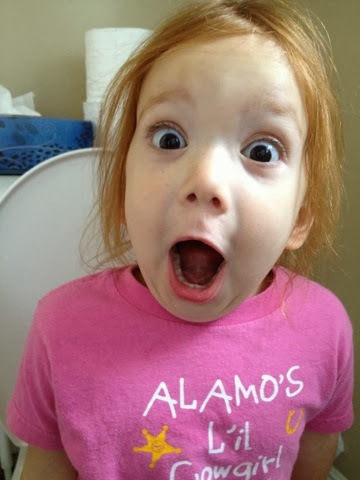 Most people would forget all about a preschooler's potty problems the minute they are out of sight, maybe think back on it with an, "Oh, that's gotta be hard." But Kristin didn't. She told me she had been going on prayer walks for Sam. That Sam's problem was so heavy on her heart. And she started literally crying when I told her the miracle God had performed just a few days before. Her compassion and love for our sweet Sam still overcome me every time I think about it, and there is no doubt in my mind that the Lord answered his servants' prayers. Samantha has done her business every day for the last two weeks. Multiple times a day. Every time, I tell her how proud I am of her, and make a giant, astonished face - if I don't do it properly, she reprimands me and shows me how I should really be doing it - classic Sam. She has even pooped in the woods on leaves when there were no porta-potties to be found at Jacob's soccer practice. WHAT?! 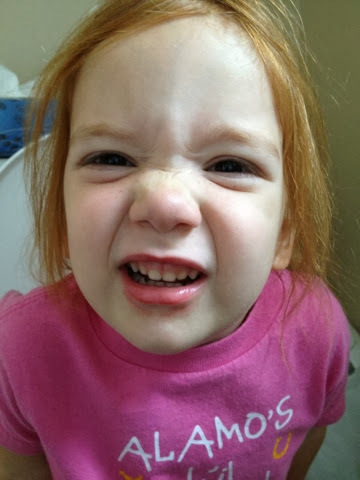 Pretty sure the other little lady in this house, who was fully potty trained in like a millisecond over four years ago, would be horrified and outright refuse if I asked her to do that. I am almost afraid to announce this chapter of our lives closed. It was such a huge part of our everyday for so long, that I'm scared it will start up again one day, as suddenly as it stopped. But for now, I am trying REALLY HARD to appreciate the new Sam every day. She is a different person. She is happier. She is not crabby and whiny and irritable because of extreme, persistent discomfort. I am so thankful she no longer has this burden to bear, and that she overcame her fear. And I am so incredibly thankful that God brought us through this journey together. My goodness, I never thought I could be so thankful for poop.